What is the definition of the term "paint cards"? What does the term "paint cards" mean in the world of poker? 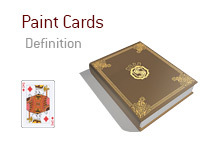 The term "paint cards" refers to any King, Queen or Jack. "Paint cards" are also referred to as "face cards" (due to the fact that Kings, Queens and Jacks all have faces). Two players get all-in pre-flop during the final table of a tournament. Player 1 turns over pocket 4s, while Player 2 turns over Kh-Qd. Player 2 jumps out of his chair and screams, "Come on! Paint cards!!" Player 1, on the other hand, covers his eyes and says "No face cards please!" Player 2 obviously wants "paint cards" to be dealt, as there would be a good chance of him making a pair if a paint card was dealt on the flop, turn or river. Player 1, on the other hand, obviously wants to avoid paint cards being dealt.